Malo was a San Francisco Bay area band that combined Latin flavor with a brass section, giving it a sound somewhere between Blood, Sweat & Tears and Santana. In fact, on the group’s first four albums – all originally released on Warner Brothers Records – the lead guitar position was ably filled by Jorge Santana, brother of Carlos. 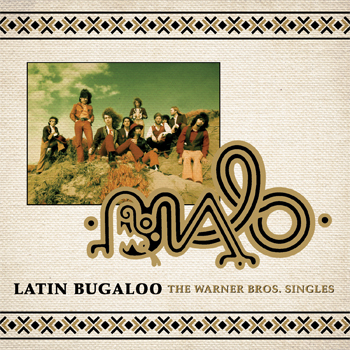 A new collection from Omnivore Recordings, Latin Bugaloo: The Complete Warner Bros. Singles brings together all of the 45 r.p.m. 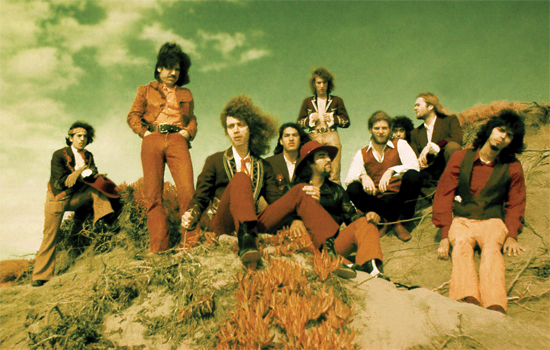 sides released by Malo during the band’s prime. Just ahead of that CD’s May 25 release date, I spoke with Jorge Santana about his old band. Bill Kopp: Malo evolved out of an earlier group, the Malibus. How did that band come together? Jorge Santana: I was still in high school in San Francisco, at Mission High School. A friend of mine named Carlos Gomez was the guitar player for the Malibus, and he knew that I played guitar. It was definitely a rhythm and blues band. I joined them, and for a year or so we played pretty much all over the Bay Area in nightclubs. Three or four shows a night, four nights a week. I understand the band was primarily doing covers at that point. When did original songs start being added to the set? There were originals, but for ourselves and for the nature of it, we were pretty much a cover band. Some of the songs, of course — things that would eventually become our hit song “Suavecito” and so forth — were already being explored within the Malibus. How did the group evolve into Malo? We ended up having a manager, Chris Wong, who knew very well the personal assistant to the producer David Rubinson. And that secretary got David to come see the band at the Night Life, a club we played often. What would you say that Rubinson brought to the table in terms of developing Malo’s sound? I don’t feel the band would have been discovered if it wasn’t for David Rubinson. He had the power to take interest and introduce us to Warner Brothers; the rest is history. On the first album [Malo, released 1972], some of the arrangements were just jams; they were very long. And somehow, after hearing every song, David Rubinson had the vision to ultimately arrange, edit and release it as what it is known now. I know Malo was a Bay Area group, but did you see the band as connected to the Latin rock tradition of L.A. groups like El Chicano and Thee Midniters? In retrospect, I’m certain that what happened was that the new association with David Rubinson, coupled with the fact that Santana was out with a new sound, motivated us to pursue more of the Latin rock sound. That was the main motivation. But we already did have Latin percussion in our band. How challenging was it to write for a group with a horn section? For me, it was very challenging. At [the beginning], with my background, I didn’t have the tools and experience to fully write. But later on, on the fourth album [1974’s Ascención], I started improvising and creating more in the style of Malo instead of just playing blues all the time. So, yes, it was a wake-up call to advance. Though it wasn’t a single — so it’s not included on the new Omnivore singles collection — I know that the track “No Matter” from Ascención is a favorite of yours. Tell me about that. We were in the studio at Wally Heider’s studio, in the San Francisco Tenderloin. By this time, I was not really knowing what was on my mind career-wise. We were doing the fourth album, tracking the very last song, “No Matter.” We only did the rhythm section; no horns. So, you only really had the percussion, guitar and bass. In my case, pretty much everything I’ve done in my life for all the recordings has been one-take. So, when I finished the first take on “No Matter,” the very first take, I remember putting my guitar down. Even now, I can see everything. I remember the floor, I remember the environment, the bright lights. We all went to hear a playback in the studio with the musicians and [producer] Fred Catero. When I heard the playback and then I heard my solo, I walked out of the studio; I had given up on music. I did not like the solo I had just taken, the performance. I was just disillusioned. I thought, “I can’t be doing this. Forget it. No more,” and so I told them, “I quit. I’m just gonna not perform anymore,” and I went to the car. I sat there, and soon Pablo Tellez and Ron Demasi came and got me back. They said, “We want you to hear this one more time.” And when I heard it, it was for the first time that I actually experienced what talent can come out of a person without even knowing. It was such a perfect solo, such a melodic solo that the first time that I heard it, I could not understand what I had just done, let alone that it had come out of me. That’s why we’re so lucky that often we catch those moments on tape, because they’re magical. We don’t capture that bit of heaven every single time. Had Pablo and Ron not got me back to the studio, I may not have pursued music anymore. But simply, what I’m trying to say is that for the first time I realized the potential that an individual has —painter, musician, actor — to find that talent is really is in everyone. So if I ever feel a little bit bummed out, all I have to do is get in the car and listen to that solo to the song. It’s for that reason that I continued; I was content with knowing that the more I applied, the more I would grow musically, the more I would have the chance to expose that and share that with the audience.